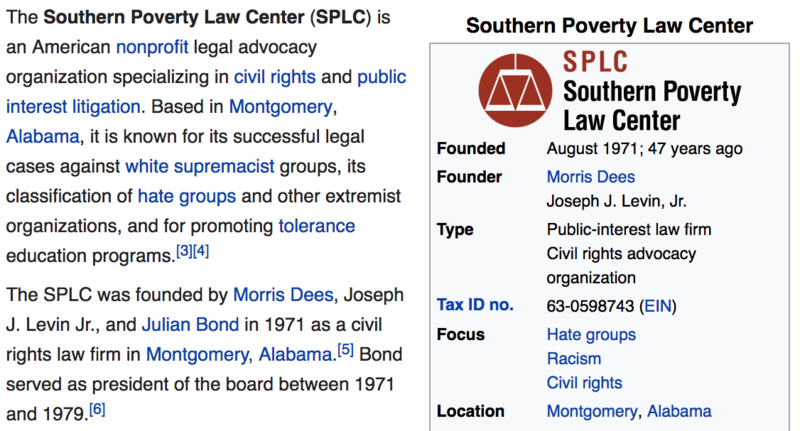 25 Comments to "Little Known Fact: "SPLC" and "SCLC" Are Not, Precisely, the Same Fundraising Organization"
If I get you correctly, Steve, and I think I do, you are saying that there are a lot of black suckers out there who thought their $4.50 donation checks were going to a Christian outfit to build a nest egg there. Old people have been known to not always be able to find their spectacles. Hey, don’t laugh, in today’s money, that’d be like $23.88 or something. I made the same mistake when I received their first letter years ago. Luckily, I was not interested donating to either organization. This method of cashing in by basking in the shadow of an organization with an alphabetically similar—but historically loftier—acronym might have other examples. Maybe, it should be considered as a thesis topic by MBA seekers. Call the paper Social Dynamics of Acronym Driven Scam Formation. Never heard of Shaw University before. But I’ll bet some people say it’s as good as Harvard or Yale. Can I bribe the women's soccer coach to get my kid accepted? This is the new bar for Elite V Non-Elite Status. SCLC and $PLC are alike in one reepect: neither one has a serious institutional mission. It’s just that one is useless (and has been for 40-odd years) and the other malevolent. The NAACP is 80% useless and 20% malevolent. Bruce Gordon during his brief tenure as staff director of the NAACP tried to re-orient the organization in the direction of practical social work (“Advancement”) and was so frustrated tangling with Julian Bond and the board that he quit. They then announced their new priority: a federal hate crimes bill. The SCLC some years back hired Martin Luther King III as their staff director, even though he isn’t a clergyman and has little tertiary schooling of any description. They canned him a couple of years later for absenteeism. 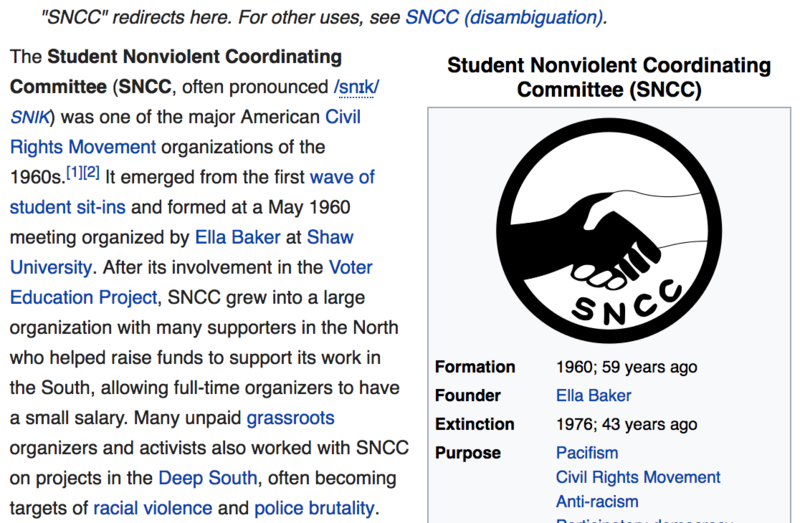 The SNCC was folded into the Black Panther Party in 1968 and that was the last of the organization. None of the half-dozen or so people who ran it between 1960 and 1968 (all but one under the age of 25) ever established themselves in an ordinary work-a-day career with the partial exception of Rap Brown, who ran a restaurant for a number of years (until the detritus of his temper landed him in prison again). Other than one woman who died quite young, the whole crew subsisted on an NGO / higher ed patronage mill for much of their life. Marion Barry and then John Lewis eventually won political office. Lewis has been for 30+ years a perfectly unremarkable back-bench member of Congress; one gets the impression he stays there (at age 78) because he has nothing better to do. Marion Barry had a more demanding position as Mayor of Washington, wherein he placed in the contest to be American’s most destructive core city mayor (the winner was Coleman Young). Roy Innes took office as President of CORE in 1968. It’s function since then has been to collect donor dollars to provide an income for the Innes family. The founder of CORE, James Farmer said a generation ago that CORE under Innes was a fraud and nothing more, but the marks who send money to Innes didn’t get the memo. What Eric Hoffer said: what starts as a movement morphs into a business morphs into a racket. $PLC has been the most adept at monetizing a shambolic exercise. Roy Innes took office as President of CORE in 1968. It’s function since then has been to collect donor dollars to provide an income for the Innes family. But they get it from Republicans. I saw Niger Innes give a talk at a major Conservative Party (of NY) event in Albany. He was a little late. But he said it wasn't "colored people's time", but Amtrak's time, that held him up. The NAACP is 80% useless and 20% malevolent. In 2012, the NAACP (not NCAA) issued a complaint against the NYC Department of Education because of the low number of blacks in the city's specialized high schools. The city vowed to rectify the problem with various tutoring programs for low-income students. Since the tutoring programs had to serve all races, most of the low-income students offered seats at the specialized high schools were either white or Asian. Due to the millions spent on tutoring, the number of blacks accepted at a specialized high school had dropped by 25 percent from 2012 to 2017. The 2019 offers should be out early this week, about 10 days later than normal. Don't be surprised if the Mayor and the left-wing School Chancellor have some evil plan up their sleeves. The Mayor can exercise control over five of the high schools (not Stuyvesant, Bronx Science, or Brooklyn Tech). "Marion Barry had a more demanding position as Mayor of Washington, wherein he placed in the contest to be American’s most destructive core city mayor (the winner was Coleman Young). " Yes, Coleman Young (Mayor of Detroit, 1974-1994) is, hands down, the winner, the gold-standard for corrupt, black politicians. After the 1967 riots Detroit riots, the whites moved out, the black drug gangs took over and the city quickly turned into a third world hell hole. FERGUSON, Mo. (AP) — Two young men were found dead inside torched cars. Three others died of apparent suicides. Another collapsed on a bus, his death ruled an overdose. Six deaths, all involving men with connections to protests in Ferguson, Missouri, drew attention on social media and speculation in the activist community that something sinister was at play. The SCLC actually hired some blacks. SCLC and $PLC are alike in one reepect: neither one has a serious institutional mission. It's just that one is useless (and has been for 40-odd years) and the other malevolent. The NAACP is 80% useless and 20% malevolent. Bruce Gordon during his brief tenure as staff director of the NAACP tried to re-orient the organization in the direction of practical social work ("Advancement") and was so frustrated tangling with Julian Bond and the board that he quit. They then announced their new priority: a federal hate crimes bill. 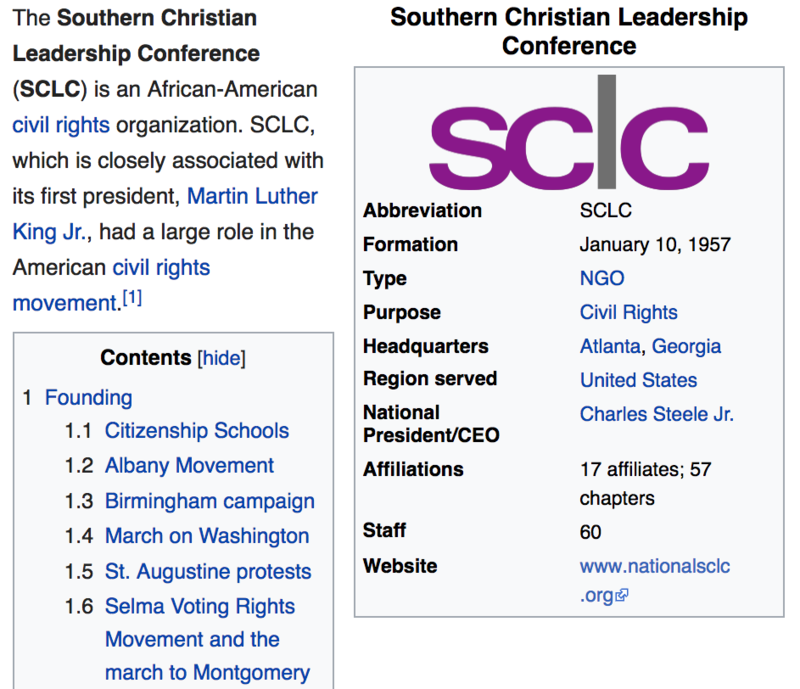 The SCLC some years back hired Martin Luther King III as their staff director, even though he isn't a clergyman and has little tertiary schooling of any description. They canned him a couple of years later for absenteeism. The SNCC was folded into the Black Panther Party in 1968 and that was the last of the organization. None of the half-dozen or so people who ran it between 1960 and 1968 (all but one under the age of 25) ever established themselves in an ordinary work-a-day career with the partial exception of Rap Brown, who ran a restaurant for a number of years (until the detritus of his temper landed him in prison again). Other than one woman who died quite young, the whole crew subsisted on an NGO / higher ed patronage mill for much of their life. Marion Barry and then John Lewis eventually won political office. Lewis has been for 30+ years a perfectly unremarkable back-bench member of Congress; one gets the impression he stays there (at age 78) because he has nothing better to do. Marion Barry had a more demanding position as Mayor of Washington, wherein he placed in the contest to be American's most destructive core city mayor (the winner was Coleman Young). Roy Innes took office as President of CORE in 1968. It's function since then has been to collect donor dollars to provide an income for the Innes family. The founder of CORE, James Farmer said a generation ago that CORE under Innes was a fraud and nothing more, but the marks who send money to Innes didn't get the memo. SCLP. Society for the Conservation of LP’s. Please, please, please, don’t show up with the Beatles White Album if the photos of the lads aren’t inside and in good condition. Suckers Played for Lots of Cash. He was a little late. But he said it wasn’t “colored people’s time”, but Amtrak’s time, that held him up. I think that new upstart delivery service, USPS, is trying to steal the goodwill attached to UPS. I've stumbled over that similarity in print before. If memory serves, there’s a delict (tort) called “passing off” which sounds like the SCLC/SPLC confusion. In 2012, the NAACP (not NCAA) issued a complaint against the NYC Department of Education because of the low number of blacks in the city’s specialized high schools. The city vowed to rectify the problem with various tutoring programs for low-income students. Since the tutoring programs had to serve all races, most of the low-income students offered seats at the specialized high schools were either white or Asian. Due to the millions spent on tutoring, the number of blacks accepted at a specialized high school had dropped by 25 percent from 2012 to 2017. The 2019 offers should be out early this week, about 10 days later than normal. Don’t be surprised if the Mayor and the left-wing School Chancellor have some evil plan up their sleeves. The Mayor can exercise control over five of the high schools (not Stuyvesant, Bronx Science, or Brooklyn Tech). I’ve stumbled over that similarity in print before. AARP does not stand for anything. When management took the American Association for Retired Persons private they changed the name to AARP. US senators are no longer appointed by state legislatures, so why is the Senate still called the Senate? Never heard of Shaw University before. But I'll bet some people say it's as good as Harvard or Yale. Can I bribe the women’s soccer coach to get my kid accepted? This is the new bar for Elite V Non-Elite Status. 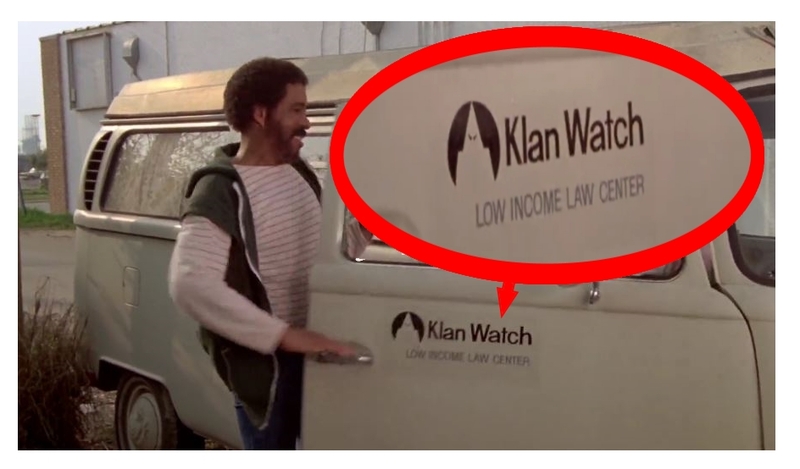 I can tell you precisely the difference between the SCLC and the SPLC. When I was a liberal working as a trade show labor organizer in Atlanta the early 1990’s, the elderly men at the SCLC who could have been my great grandfathers sexually harassed me. But they dressed really well and didn’t push the issue too hard, though it was of course disappointing. When I became a vocal opponent of hate crime laws in 1997, the SPLC came after me like a bunch of horror novel menopausal earth-shoe wearing yet still astonishingly male harpies. They had no excuses for resentment (since all of them seemed to summer in Hyannis Port) and were far more pervy in their ambiguous sexuality than a bunch of nattily dressed old black guys from Cascade Drive who actually lived through Jim Crow.